The Town of Oro Valley is located in Northwest Tucson just 3 miles north of the Tucson city limits. It is about 10 miles from downtown Tucson. 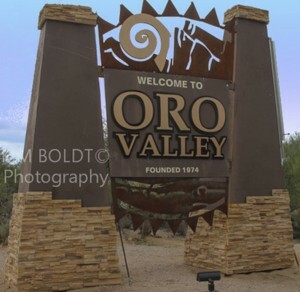 Incorporated in April 1974, the Town of Oro Valley is home to over 45,000 residents. The Town of Oro Valley is governed by a council-manager structure and has 7 members. The town covers a bit more than 36 square miles and all Town of Oro Valley subdivisions have mountain views. The Town of Oro Valley has received recognition as one of the top communities to live in the United States. The Town of Oro Valley is located between the Catalina and Tortolita mountain ranges. With an elevation of 2,620 feet, the temperatures are cooler. Oro Valley is one of the sunniest and more comfortable places to live in the USA. The annual average high temperatures is around 83 degrees. Annual average lows are close to 54 degrees. Yes, summer day highs will be in the 100’s. Bear in mind, low humidity and the elevation make these temperatures very tolerable. Tucson is roughly 6 hours from San Diego and the Pacific Ocean about 6 to 7 hours away. The beaches of the Sea of Cortez, also known as the Gulf of California, are just 4 hours away in Puerto Peñasco, Mexico. Also know as Rocky Point, Mexico. Las Vegas is a 6.5 hour drive. For professional sports, Phoenix is only 1 ½ hours to the north. The Tucson area offers things to do. If you want to go skiing, Mt Lemmon is only 45 minutes away. At 9,200 feet, this peak of the Santa Catalina Mountains has skiing from mid November thru March. They make snow to add to the natural winter snows they receive. To the north, the White Mountains are about 3-4 hours away. The White Mountain have cooler summer temperatures and skiing during the winter. This is a popular summer getaway spot is Mt. Lemmon. Flagstaff is in northern Arizona about 5 hours away. Flagstaff has outstanding skiing and is just a few miles from the south rim of the Grand Canyon. The Petrified Forest National Park is also close by. The Town of Oro Valley and its communities and subdivision provide a great place to call home. Schools are well ranked and recreational areas are “right next door”. Golf, Tennis, hiking, biking and parks abound. Are you thinking of buying a home in The Town of Oro Valley or the greater Tucson area? Finding the right home can be a challenging process. But we can make the process much less stressful for you. If you are considering The Town Of Oro Valley as a place to live or a future place to retire to, we can help.